Indians open season with a lost opportunity to rid itself of an antiquated, racist symbol. Look, people can disagree on this. In fact, many Indians fans probably disagree with what I am about to write. And what I'm about to write isn't new, or groundbreaking, or if we want to be honest, even very controversial. Except for those Cleveland Indians fans to whom it is. How long do you think the stadium would stand if it (the team) were called the Cleveland Negroes with a caricature of Aunt Jemima or Little Black Sambo? But opinions (and people) can mature, and context can be gained. And that maturation and context has led me to conclude what I see as obvious--in no way is a cartoon image of a red-faced, hook-nosed, ghoulishly grinning Native American appropriate in America, let alone for a professional sports franchise. In fact, it is the only logo in all of professional sports that characterizes a race of people with such a caricature. Yes, other teams have issues with their names, chants, or songs. But even "Washington Redskins" is not as racist as the cartoon logo of the Cleveland Indians. This is not a new opinion. The very first pitch at Jacobs Field was thrown out by President Clinton 22 years ago, and he sure as hell wasn't going to have that on his hat. I remember some people being annoyed by that. (Then again, some people are annoyed by anything a Democratic president does.) 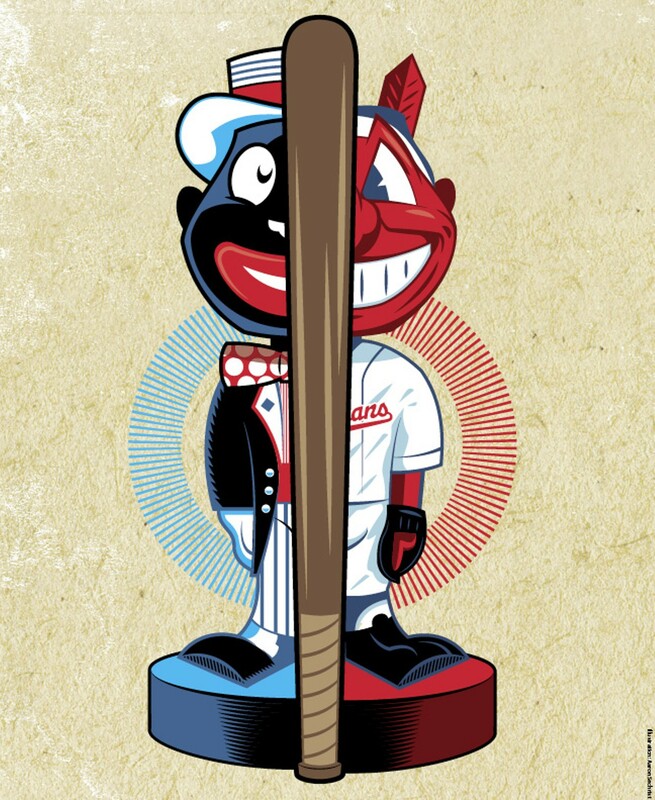 As mentioned, every thoughtpiece for ten years has reached the same conclusion: that Chief Wahoo is racist. Period. Certainly nearly every Indians fan who wears a Chief Wahoo logo isn't trying to communicate some passive-aggressive racist message, nor has anything remotely close in their heart, but that is completely irrelevant. At some point in the past 15 years, many people have shared the same realization; that it's not acceptable to wear this cartoon on your person. The Indians know this as well, but for some reason refuse to completely get rid of it. For years it's being less and less a major part of the uniform, the stadium, and the digital presence, but never completely removed. Even this year, when they "officially demoted" Chief Wahoo to secondary status (e.g. not the primary logo, although still on all sleeves and home caps.) Turns out this is just a half-measure, and nowhere near enough. For the duration of Chief Wahoo's tenure with the Indians in the post-Civil Rights era, the city's teams have unequivocally sucked. Not just the Indians, but all of the major professional teams, including the Browns and Cavaliers. Regardless of the absolute truth of that, we all know how long it has been since we've seen a championship, and for all Clevelanders under 51 years old, that means our eternity. So if we can take a stab at doing the right thing, and maybe changing our collective karma at the same time, why can't the Dolans just do that for us? Any straw man business argument can be knocked down immediately. This team that isn't selling any merchandise or drawing fans to the ballpark isn't going to see its wonderful success immediately plummet. They can hardly draw less attendance than last year. It's not too late. Order some new hats, cut the cartoon off the sleeve. And Go Tribe. I'll proudly wear my team gear. Just not Chief Wahoo.